Vince Loschiavo’s fourth goal of the postseason turned out to be an overtime game-winning goal, as well as a series clinching snipe as the Edmonton Oil Kings (4-2) rallied to defeat the Medicine Hat Tigers (2-4), 4-3, in front of 2,872 fans at the Canalta Centre on Sunday night. 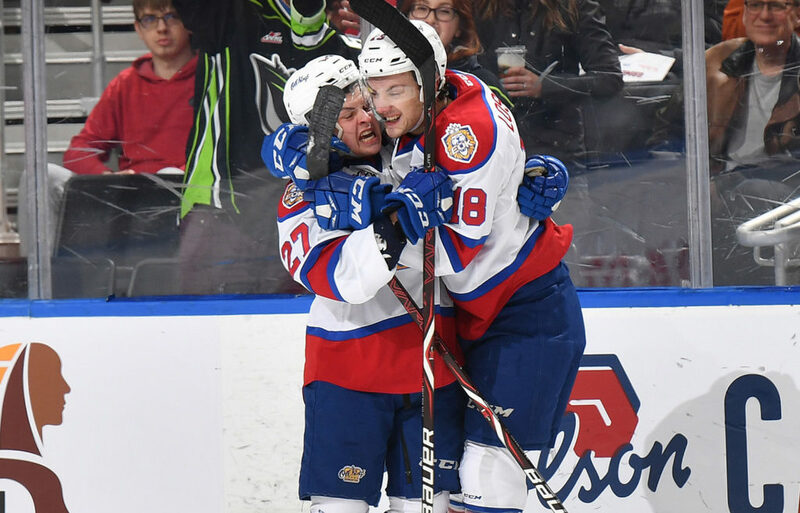 The Oil Kings win the best-of-seven Eastern Conference Quarter-Final playoff series, 4-2, and will now advance to play the winner of the Lethbridge Hurricanes and Calgary Hitmen in Round 2. The Hurricanes claimed a 7-6 overtime victory earlier Sunday in Game 6 of their series, and will play Game 7 at the Enmax Centre in Lethbridge on Tuesday night, April 2 at 7:00 PM MT. After Trey Fix-Wolansky opened the team’s scoring, Edmonton trailed 3-1 in the second period but rallied back with goals by Wyatt McLeod and Conner McDonald to send the game to extra time. Todd Scott (3-0) picked up the series-clinching win between the pipes, turning aside 26 of 29 shots he faced. Mads Sogaard (2-4) took the loss, surrendering four goals on 36 Oil Kings shots. Fix-Wolansky opened the scoring for the Oil Kings under five minutes into the first period with the team’s first shorthanded goal of the postseason, his third goal of the series – unassisted – at 4:09. But less than two minutes later the Tigers clawed back, evening the score at 1-1 on a goal by Corson Hopwo at 5:54 which wrapped up first period scoring. Shots on goal in the opening frame were 11-10 in favour of Medicine Hat. In the second – to the ire of the Oil Kings – a goal by Ryan Jevne was initially disallowed after contact with Scott behind the net but was allowed to stand after review, giving Medicine Hat a 2-1 lead at 7:14. Frustration continued to mount after the ensuing faceoff at centre ice, as the Oil Kings were whistled just six seconds later for high sticking, and the Tigers pounced. Jevne carried the momentum in the home team’s favour by scoring his second of the night just 27 seconds after his first, giving the Tigers a two-goal lead, 3-1, at 7:41 on the power play. But the Oil Kings answered immediately, as McLeod tallied his first of the playoffs, unassisted, 25 seconds later to once again make it a one-goal game, 3-2, at 8:06. Shots on goal in the middle stanza shifted in Edmonton’s favour, 14-12. The Oil Kings got off on the right foot in the third, as McDonald danced deep into the Tigers end and beat Sogaard, however confusion once again ensued as the goal light came on and it was ruled by the officials as a good goal, but the play on the ice was under review. This time it played to Edmonton’s favour, as McDonald was credited with his first of the playoffs, from David Kope and Jake Neighbours, to erase the deficit and tie the game, 3-3. The rest of regulation was a tight-knit affair, as neither side would register the go-ahead marker and the game was off to overtime for the first time in the series. Just 2:43 into extra time it was Fix-Wolansky who barreled in on the near side on a 2-on-1 chance, feeding Loschiavo for his fourth of the postseason and the series clinching goal. Shots on goal in the third was 10-5 Edmonton, and 3-1 Oil Kings in the overtime frame. Medicine Hat was 1-for-3 on the power play, while Edmonton finished the game going 0-for-1 with the man advantage but registered a shorthanded goal. Medicine Hat overagers Linus Nassen (MH) (3), Dylan MacPherson (MH) (2), and Ryan Jevne (MH) (1) were selected as Three Stars of the Game.